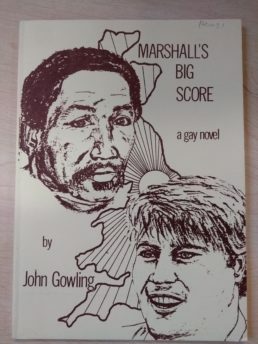 1976: One hot summer night in a gay bar in Liverpool, Martin, a white gay man from Stockport, meets Marshall, a black West African sailor. They drink, dance and fall in love – fast. Marshall’s Big Score chronicles the ups and downs of their relationship over the course of three years. The book is by John Gowling, who was a member of the Commonword group Northern Gay Writers. You get a really strong sense of what Manchester and urban life in England was like in in the late Seventies. Martin, Marshall and the people around them lead incredibly precarious working-class lives; low-paid jobs, dangerous jobs, poor housing and an array of characters in desperate need of health and social care. But there is also the excitement of gay bars and clubs that stay open late where you can enjoy yourself and easily pick someone up for the night. This is an era of relative freedom before the AIDS crisis of the Eighties. Here’s a playlist of the songs mentioned in the book, a soundtrack to Martin’s life and a nice little reminder of how inseparable black culture is from gay/queer culture. Perhaps the discrimination that was around Britain in general terms was working the other way for gay people; perhaps we all had too much prejudice laid on us about being gay to afford dabbling in racial and traditional differences. Two thirds of a page are dedicated to Martin’s thoughts about prejudice, but apart from that, there is little pontification. The characters and their lives aren’t very well-fleshed out, not even Martin’s. You meet his parents briefly, but it’s unclear whether Martin is out to his parents. There is no outward hostility; just a resignation that their wayward son hasn’t settled down and got a proper job. There are occasions where Martin’s humour and frustration punches through, but they are rare and brief. It’s hard to get a sense of what the characters are really like; they don’t really possess characteristics. They are too busy in the moment; either struggling to get by or completely immersed in their passions. There is a lot of potential here!